Avry of Kazan is the last Healer in the Fifteen Realms - and only one other person knows she's still alive. In order to prevent King Tohon and his army of walking dead from taking over the Fifteen Realms, Avry and Kerrick part ways - Avry to seek her sister and infiltrate the holy army, and Kerrick to his home realm of Alga to summon his countrymen into battle. You know, I am really starting to think that I am either very lucky or second book syndrome just does not exist (at least this year). Scent of Magic is the second installment of the Healer series, and I loved it even more than the first one. This was a sound addition, and it definitely has me convinced I need to get actual physical copies of these books to keep on my shelves and re-read. Avry has actually changed a lot in this novel. She came across as someone who is more sure of herself and her abilities, and I appreciated that. There were still moments when her vulnerability shone through, but overall, she was a very tough, very brave character. I was rooting for her from the first page up until the last! Kerrick demonstrated more than just his leadership, physical and magical prowess in this novel. His softer, vulnerable, emotional side is definitely seen quite a bit in this book, and that lent a bigger air of relatability to him as a character. If I hadn't already loved him after the first book, I would definitely fall for him in this one. While I'm sure there are others who would disagree, I actually appreciated the fact that Avry and Kerrick go off on their own separate adventures, as it gave a larger, richer glimpse of the world that they live in. Avry's story allowed us to discover more about Estrid and her army, while Kerrick's story introduced the tribes and their culture. The world in this series just keeps on growing, and as a sucker for detail of that kind, I absolutely adored it. Since they were separated, there was obviously a lack of romance in this one. Obviously, I am sad about this. I won't say that there's no romance at all, but I felt like it wasn't enough for me. I am also sad about how the gang I had grown to love in the first book is flung apart to all different corners for this book, instead of being together. It makes sense in the story, but it still hurt to not have them be working together and in the same place. This book was a thrill to read, as readers learn more about Estrid and her army, Tohon and his army, and the state of unrest in this fantasy world. Apart from all this new information, readers will also find the familiar, comfortable characters we grew to love in the first book, particularly Avry and Kerrick. This combination of new and familiar, as well as the action-packed moments, and dual point of view, has culminated into a book that is absolutely wonderful. Scent of Magic may have nearly killed me with its cliffhanger ending, but there is no doubt that Maria V. Snyder has earned a loyal fan in me! You are lucky-I read more than a few mediocre second books this year. Happily I thought this one was pretty good although I would have liked more romance as well! I missed the romance a little, but I am kind of glad it didn't take center stage in a way. I can't wait for the next one! I LOVE Snyder's books! Looking forward to reading this one! Wonderful review, Alexa! I have never read any of Maria's books, but I have definitely been meaning to for a while. 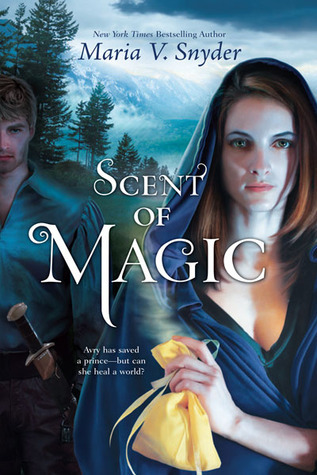 Scent of Magic sounds like a great second installment. For me this one did suffer slightly from second book syndrome, but only slightly, mostly because I felt it was a bit all over the place with everything going on. I so need Taste of Death RIGHT NOW!